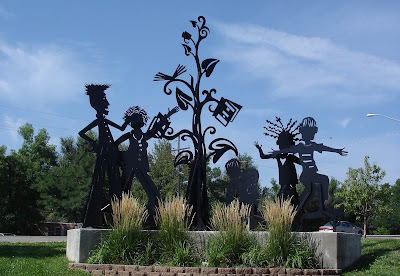 Since I am a new member to the Lafayette Public Art Committee, I thought I should familiarize myself (and you by default) with the art around my town. We have two public art installations at our library. The first is a tile mosaic mural that I showed you before. I love this one. It is my first personal experience with public art. To fund the project (many years ago) they (the powers that be) "sold" tiles to members of the community. My mom bought tiles for me and Jeremy as a gift. Somewhere on that mural, on the backs of the tiles are my and Jeremy's names. My mom never knew what she started with me, with that gift of tile. I appreciate this piece for its historical depiction as well as its complex medium. 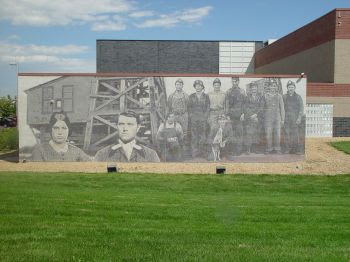 Imagine putting together a mural that big, using only 1 inch black and white and gray tiles. The second library piece is a metal sculpture that sits at the driveway to the building. It is called Within your Reach. I enjoy this piece for its whimsical nature. It is a depiction of joy and childhood, as well as reading and learning. Stay tuned for more Art Around Town. There is lots to share in our little town. We love art, we embrace art, we make art public. Enjoy!